A mirror plays a significant and vital part in the bathroom. Not only is it a necessity for getting ready every day, but it also creates openness and furthers the overall decor. A well-selected mirror can upgrade and transform the entire bathroom’s appearance. All Glass of Newnan offers extensive customization options to fit your style, such as Frameless, Medicine Cabinet, Chrome, Glass Mosaic, Framed, Silver-plated, Traditional, and Modern styles. The ideal mirror choice can foster openness. Regardless of the size of your bathroom, a mirror creates the illusion of being more spacious. An overall bathroom expansion may not be fiscally possible, but a mirror is an affordable way to transform a space to feel larger and more luxurious. Even if your bathroom is sizable, a well-selected mirror or even dual mirrors can provide extra function and openness, so the vastness of your bathroom is further enhanced. 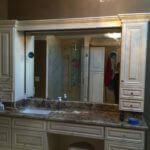 The team at All Glass is committed to maximizing the potential of your bathroom through the perfect mirror selection. The bathroom mirror is important for achieving your desired style. Upon entering the bathroom, the mirror instantly draws the eye. Since it is the focal point of the bathroom, having a mirror which fits your needs and style is vital. Regardless of your style–high-end modern design, vintage shabby chic, or traditional classic, All Glass of Newnan has the perfect mirror for your space. 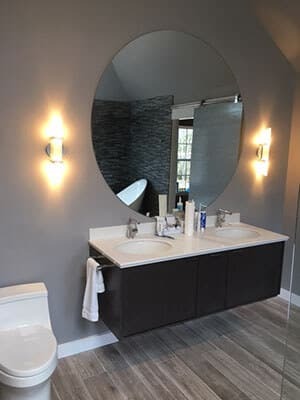 Our team of professionals will help you determine the mirror which will further your overall style and then we will install the mirror for lasting hold. We always find the studs to ensure your mirror will remain secure and not harm your sheetrock. Our mirrors are the ideal finishing touch to showcase your bathroom’s theme and decor.